Yesterday's outlook expected upwards movement in the S&P 500 (SPX) toward two different target zones, 1412-1416 and then 1420-1426 beyond that. The rally substantially outperformed and continued up past 1426, which invalidated my short-term preferred count and now opens up the next target zone of 1440-1460. The European Central Bank announced yesterday that they would provide additional bond-buying, which effectively offers more liquidity steroids to an already-pumped-up market which could put Ahh-nold (Schwarzenegger) to shame. This inspired me to draw up a chart illustrating how the Central Banks have "printed our way to prosperity." This chart isn't a full accounting, and completely ignores the actions of the Bank of England, Bank of Japan, and even some of the ECB's past programs. 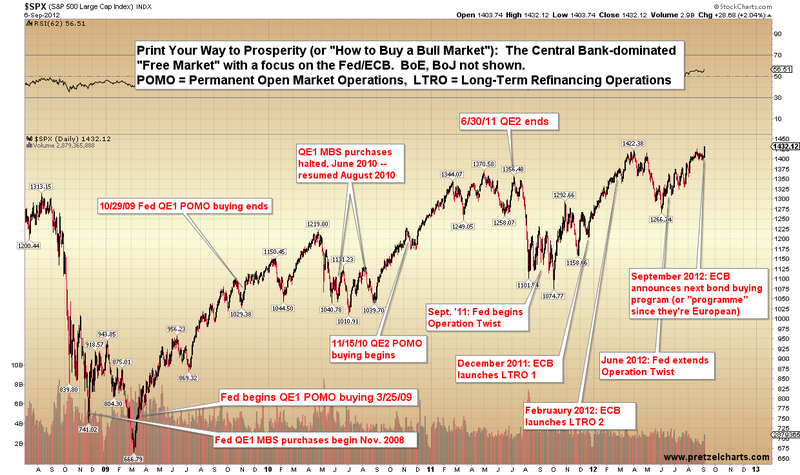 The Central Banks remain the x-factor in any and all long-term analysis, and it seems that every time the markets try to return to any sense of normalcy, the CB's step in and goose the market with another round of printing/lending/throwing money out of helicopters. Yesterday's price action was still well-within the parameters of the preferred long-term outlook, and if this is indeed an ending diagonal for intermediate wave (c), then the long-term pattern still appears on track, and actually looks better with higher prices over the near term. 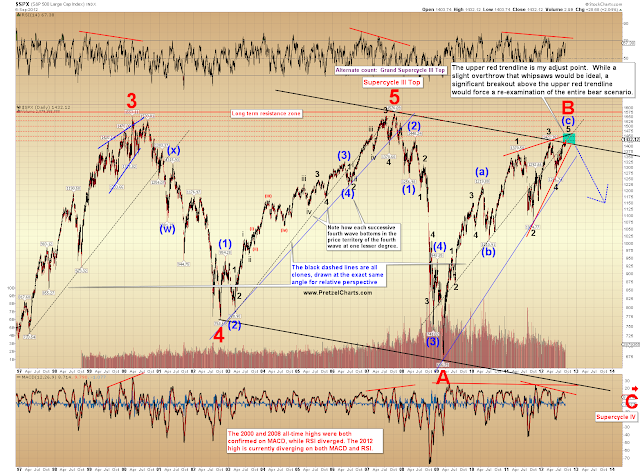 The chart below outlines my adjustment point from bear to bull, which is represented by the rising red trendline. If the market can somehow sustain trade above that level going forward, then I will capitulate the bear case until further notice and simply join the masses in singing the endless praises of the printing press. Presently, my preferred long-term outlook remains in expectation that a top is forming, though this could be several more weeks in the making. Incidentally, while I have been long-term bearish for some time, I do not want to develop a reputation as a "perma-bear." Newer readers probably don't realize that I was bullish at the October 2011 low of 1074 (and called that turn to the day), as well as very bullish at the March 2009 low of 666 (and also called that bottom to the day, in real-time). I am not a perma-anything; I'm simply long-term bearish at this time. I continue to work both sides of the trade on the shorter time frames -- in fact, my key levels yesterday led right up the market ladder, and the market reached all but the final target: I suggested a breakout above the triangle (which crossed 1408) would lead to 1416; that a break of 1416 would lead to 1426, and that a break of 1426 would lead to 1440. I'm also not perfect, and it's always possible that my long-term bear outlook is entirely off-base. I simply call what I see. During the weekend, I'll delve further into the bull potentials and expand next week on whatever data I find in support of the bull case. The next chart is the 30-minute SPX chart, and the price action strongly argues for higher prices over the near term. Somewhere in here, we should get a sideways/down consolidation in wave (4) of 5, which should ultimately resolve higher in wave (5) of 5. 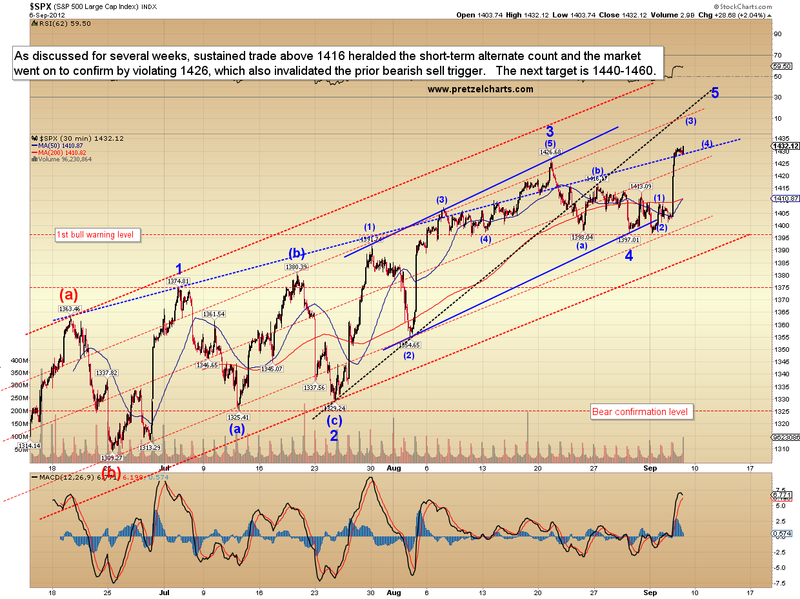 If my intermediate outlook is correct, then 1440-1460 is the next price target. Next, a quick update to the Nasdaq 100 (NDX), which has so far performed as expected and is on track for the 2900-3000 target. 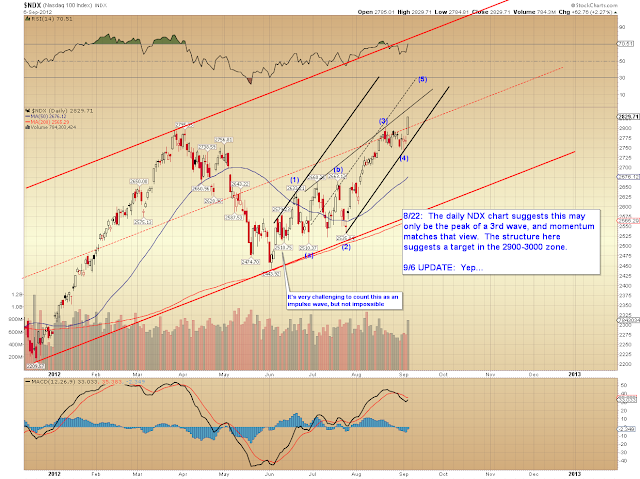 I was unsure if SPX would break back above 1426, but I felt reasonably confident that NDX would make new highs, as last discussed in this article from August 22. Finally, a quick update on gold, which yesterday captured my 100 point target from July (from 1610 to 1710). 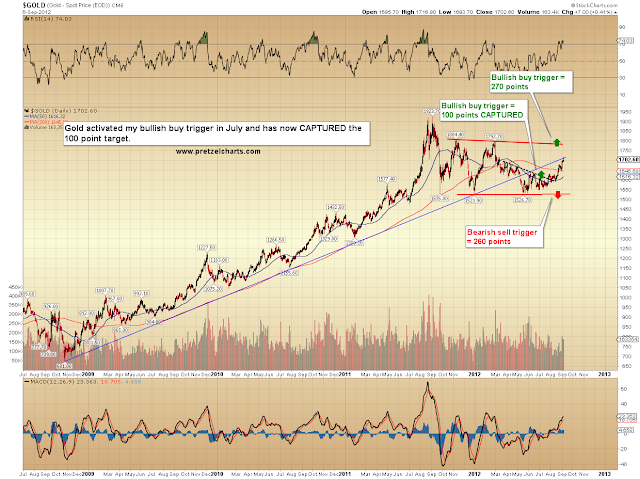 Gold could encounter resistance from the broken blue trendline. In conclusion, yesterday suggested strong momentum, and that type of move usually carries over with residual upwards momentum. 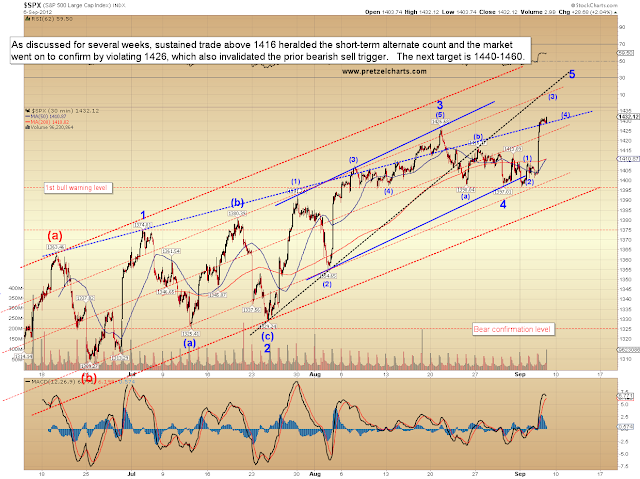 The next target for SPX is 1440-1460; and I'll try to narrow the target down further as the structure takes shape. Trade safe. You might correctly predict bottoms a couple times but you also incorrectly predicted peaks hundreds times, like every day since months ago. Well, one day you'll be correct if you continue, I'm so sure, LOL!!! Yes, you're a perma-bear (because you've been so wrong and stubborn) even though you refuse to accept it.